In the southern parts of the U.S., there’s really no escaping the heat. You either find a place to cool off or you learn to deal with it. Thankfully, many of us can relax in our homes, which provide a safe haven with a cool, comfortable temperature. When something goes wrong, however, our living environment (and mood) can quickly change. Keeping your grass, plants and trees healthy and well-maintained can be a challenge. First, you have to have the time to dedicate to your lawn. You also need to make sure you have the right equipment and that it is all in working order. Finally, you need the expertise to know which types of plants work best in which environments, how often to water and how to spot signs of lawn pests and diseases. For homeowners in southern states, the warm climate, lack of rainfall and intense sun make it even more difficult to care for your outdoor spaces. There is a lot to like about living here in Corpus Christi. Watching the sun set over the ocean. Being able to feel the sand between our toes. Sailing, boating and fishing most of the year. What’s not to like? 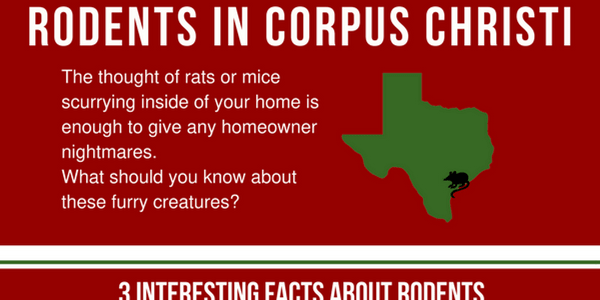 Unfortunately, as in most cities, here in Corpus Christi, Texas, rats and mice live alongside us. While rodents might look cute at the pet store, no homeowners look forward to seeing these furry creatures in or around our homes. They can cause damage to our homes, eat our food and transmit serious diseases. There’s a reason that people mention this word when something bad happens. Rats—and mice—are two of the most common household pests. While some people think these furry creatures are cute, they are not welcome in most homes. These animals, and other rodents, can transmit disease, damage your property, get in your food and generally make a mess. Rodents are the world’s most common mammals. With native species on every continent except Antarctica, rodent species also include squirrels, guinea pigs, gerbils and beavers. 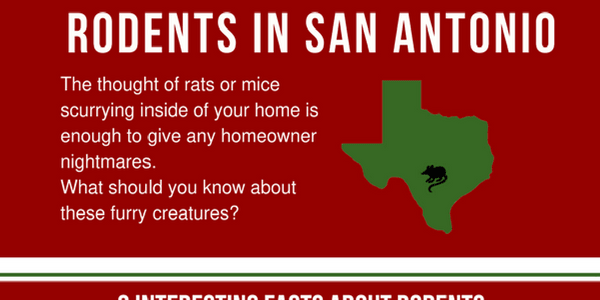 As a homeowner, what should you know about rodents? 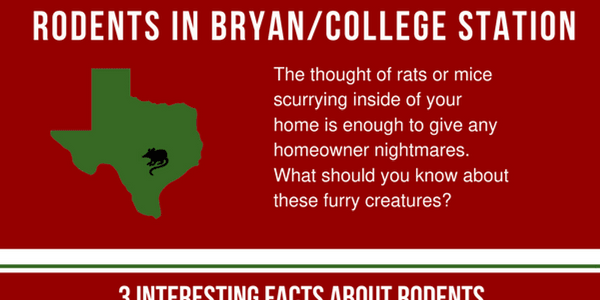 Which types are most common in Bryan/College Station? What risks do these animals pose to humans, how do they enter your home, how do you know they made it inside and perhaps most importantly, how do you get rid of rats and mice? 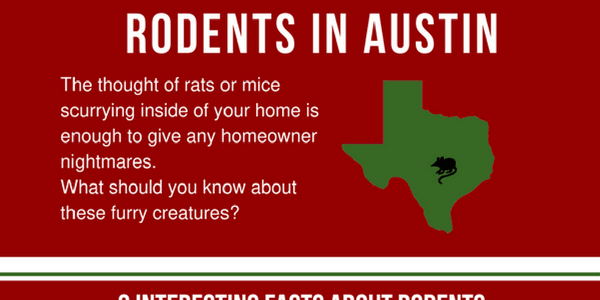 Check out our infographic below to learn everything you need to know about rodents. We feel very lucky to be based here in Orlando. From museums to sporting events to outdoor activities, there is always something fun to do in our city. While other parts of the country are experiencing freezing temperatures, it’s usually sunny and warm here in Central Florida. Even living in the best city on the planet, there is one thing we wish we didn’t have to deal with, and that’s Florida rats and rice. Rodents might seem cute and furry, but they are considered a household pest for good reason. Rodents can damage your home by chewing on wood and cause a mess by getting into birdseed, pet food and your pantry. In addition, these small creatures can transmit serious diseases. As the fourth largest city in the nation, Houston is known for its vast array of restaurants, the museum district and as the home of NASA’s Johnson Space Center. Unfortunately for those of us that live here, Houston is also known as the pest capital of the United States. Why? In addition to a large human population, whose trash provides a plentiful and consistent food source, the city’s warm and humid climate is a perfect place for all types of pests. 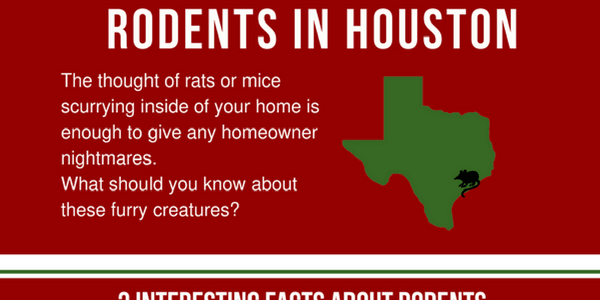 One common pest Houston homeowners contact us about most frequently are rodents. In Houston, Texas, rats and mice find their way into your home, eat and chew wood and food, leave a mess and can infect humans with some very serious diseases. Rodents are everywhere. Everywhere, that is, except Antarctica. These animals are native to every other continent on Earth. Sometimes cute and furry and sometimes menacing, there are many different types of rodents. From the world’s largest rodent, the capybara, which can grow to be the size of a dog to the pygmy jerboa, which reaches only five centimeters long, these animals have had a significant impact on humans. The most common types of rodents homeowners encounter are mice and rats. While these furry creatures can serve as pets, many of us find the presence of these animals in and around their homes to be a nuisance at best and a dangerous pest when it comes to transmitting disease and damaging or destroying property. Out of the nearly four thousand mammal species which live on Earth, nearly 40% come from the order Rodentia. As you might have guessed by the name, these animals are rodents. From the pygmy jerboa, which measures only five centimeters long to the capybara, which can grow to be about the size of a dog, rodents come in many shapes and sizes and include squirrels, gophers, guinea pigs, hamsters and gerbils. Rats and mice are some of the most common types of rodents on Earth. While some people keep these animals as pets, for many homeowners, these furry creatures are a common pest. Florida—the sunshine state. Known for coastline beaches, top vacation destinations, and of course, our very own Walt Disney World, the state is a destination for travelers across the world. Florida’s diverse land and ecosystems provide ideal living conditions for both land and aquatic animals as well. Here in the central part of Florida, we live alongside different animal species. 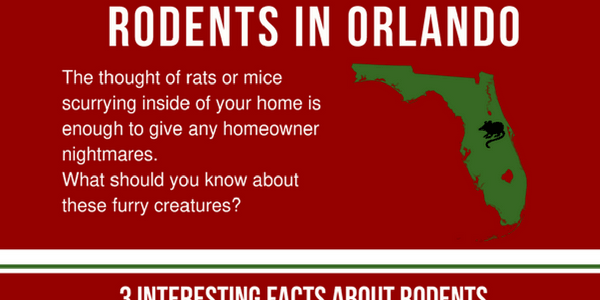 In this post, we’ll take a look at the array of Orlando wildlife residents and homeowners like you can come into contact with. We’ll discuss topics such as reproduction, eating habits, and where they choose to make their homes. We’ll even examine ways to ensure these animals stay off your property for good. Read along as we dive into all there is to know about Orlando animals. Despite it being an essential aspect of your home’s ability to function correctly, plumbing isn’t something that we think about a lot. Each day, we simply expect our toilets to flush, the sink disposal to drain and the shower pressure to remain steady. It’s only when our plumbing system stops working that our home’s pipes become a top priority. As a homeowner, it’s best to be prepared for anything—including an unexpected plumbing problem. Below we’ll discuss the most common plumbing problems we see, how to detect the onset of a problem and how to fix it. Most homes are equipped with an underground plumbing system. If your home has a basement, many pipes can also be found there. And while most pipes last for decades, many begin to leak when that time is up.